We are excited to introduce the 2017 fellows and the government partners that are changing how they deliver key services. This year’s Code for America fellows have backgrounds in urban design, software engineering, web design, UX research, community organizing, policy, and data science. The Fellowship program is Code for America’s longest-standing initiative. As with all of the work we do, we are continuing to iterate and improve based on user feedback. 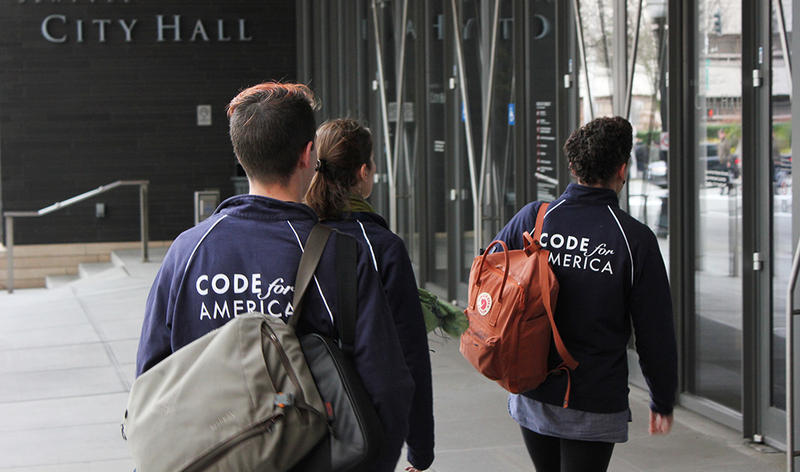 Rather than having a single fellowship class, we now have rolling teams of fellows joining throughout the year and working alongside Code for America staff. Learn more about how the Fellowship program has evolved from Code for America’s chief program officer, ST Mayer. We are excited to introduce these mid-career tech professionals and the government partners that are at the forefront of changing how they deliver key services. This year’s Code for America fellows have backgrounds in urban design, software engineering, UX research, community organizing, policy, and data science. They hail from civic engagement startups, people-centered design firms, and software development companies, including Pivotal Labs and Fitbit. This year’s fellows bring their skills to bear on some of our nation’s biggest challenges alongside government partners in California, Alaska, and Oregon. Helping job seekers access workforce services in Alaska and California: Fellows are partnering with the Municipality of Anchorage, AK and the San Diego Workforce Partnership to better connect job seekers with public services that will help them find and keep employment. Connecting survivors of violence with information to aid in their recovery: Fellows are working with the Department of Community Crime Victim's Services in Multnomah County, Oregon. Their work helps connect crime victims with services to stay safe and recover. Please welcome Adrienne Dreyfus, Christa Hartsock, Clorama Dorvilias, Julie Sutherland, Kimberly Voisin, Paras Sanghavi, Pam Dineva, and Tom Dooner to the Code for America network.